Mansion Stoupa: where it all began.. 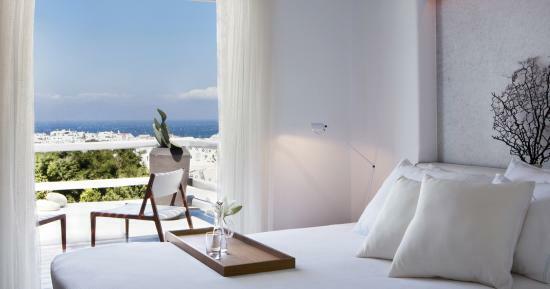 Mansion Stoupa, incongruous amidst the Cycladic architecture of Chora, a fertile estate in the endless barrenness of Mykonos, a family, a vision. 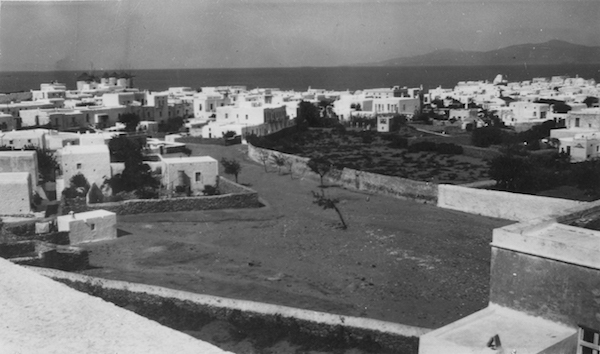 And so the story goes..
Once upon a time there was a fertile estate, a rarity on this barren island – that prevailed year after year on the outskirts of Chora. Anything planted there immediately thrived! But there was another reason why the odd passerby would feel pangs of envy when chancing upon this verdant expanse: the location. Elevated and noble, it had a majestic view of the deep blue sea. In the 1850s the owners erected a stately villa on this exceptional plot of land, named Mansion Stoupa. 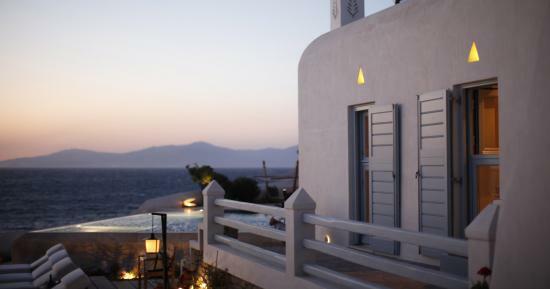 The pilasters and small decorative details, popular in urban residences at the time, stood out like sore thumbs amidst the Cycladic architecture and caused a sensation. The famous Mansion Stoupa was passed down from generation to generation, eventually ending up in the capable hands of Sofia Ioannidis. The family used the mansion as a holiday home for years. They would leave their main residence in Mikri Venetia (Little Venice) and walk down there whenever they felt like a change of scenery. 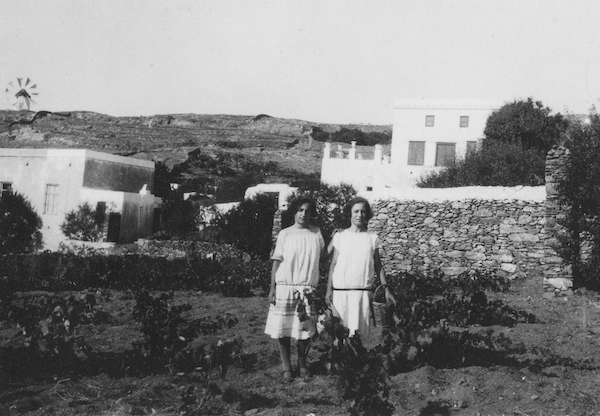 From 1960 to 1990, Sofia Ioannidis rented the mansion to distinguished guests who spent their vacation in Mykonos. 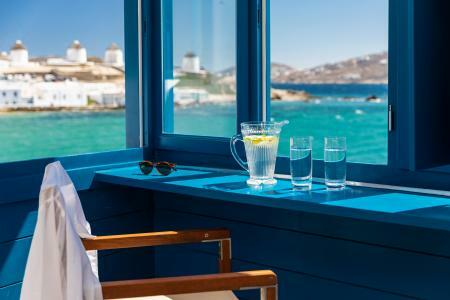 Who wouldn't want to vacation on a Cycladic island, in a luxurious mansion surrounded by cherry blossoms, grape vines, fragrant rose bushes and tall cypress trees, casting heavy shadows on hot summer days? The visitors renting Mansion Stoupa were mainly French politicians and European artists, until Pierro Amversa made his first appearance on the island. 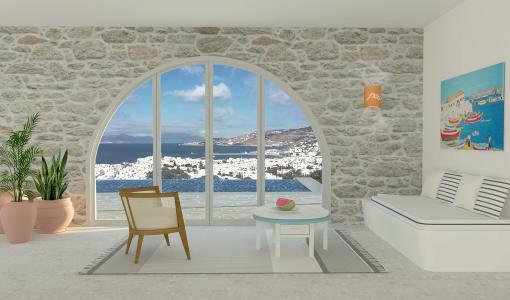 From the very first moment he set foot on Mykonos, he vowed to return. The Argentinian painter felt so at home surrounded by the boisterous holiday crowds, he decided to open a different kind of bar. The legendary Pierro's was just that: his wildest dream come true! He started out throwing extravagant parties at Mansion Stoupa and slowly started redirecting traffic to his bar, where taboos and puritanism never went past the front door. He painted a big red P outside, kept a vicious dog in the garden to ward off trespassers and lived in his very own ivory tower! He divided the space with flowing fabrics and created a mystical atmosphere that bewitched guests, often whipping them into a frenzy! Celebrities visiting the island were always invited to Pierro's "Dionysian" dinners at Mansion Stoupa, where alcohol flowed freely, the food was plentiful and the nights were audacious, to say the least. When Pierro passed away, the Ioannidis family reclaimed the mansion and discovered a forgotten guestbook. Although it was partially ruined, Princess Soraya's signature – a frequent and honored guest of the painters “ was still discernible. It was the end of an era for Mansion Stoupa and the legendary beginnings of the Belvedere hotel.